Ok, the very name conjures up horrible images if you've never been there. With other names in Death Valley National Park like Devil's Race Track, Furnace Creek Ranch, Badwater and Ubehebe Crater there is nothing to stop the mind from wondering about the names. That's fine with me because it keeps the place less crowded. As you will see on this page the place can be very pretty. We have been there at many different times of the year but this time in late November it was particularly nice. The story goes....a group of gold seekers in the gold rush of 1849, wandered into the valley by accident, because they decided to separate from their larger group. The smaller group wanted to take a "shortcut" and wound up in Death Valley. This group consisted of 4 families and a group of single men known as the Jayhawkers. Up and down steep terrain, along with limited food and water for their stock began taking a toll on their stock and draft animals. Most of the oxen they used to haul the wagons died. Supplies ran low. The group split up again. One family made it out alone with their wagon intact. The Jayhawkers burned their wagons near Stovepipe Wells to smoke the meat from their oxen. At some point during their stay in the valley, Captain Culverwell died. Don't know why, but no mention is made of his death being due to starvation, thirst, harsh environment, etc. Anyway, on the way out, as they were nearing the top of the ridge with a final look down on the valley, a female member is said to have exclaimed, "Goodbye, Death Valley." And the name stuck. This is a 20 mule team wagon. The larger wheel is 7 foot in diameter. 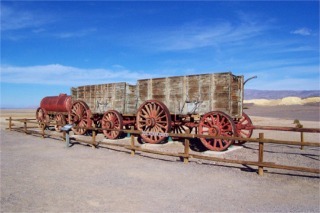 They actually used 20 mule teams to haul Borax out of Death Valley to Mojave. Furnace creek got it's name not from the intense heat in Death Valley but from the furnaces there used to process ore in the Borax process. In the summer they had to stop the Borax mining because it was so hot they couldn't cool the processing water enough to crystallize the borax. 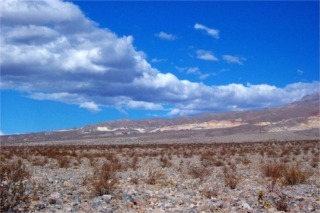 Death Valley is the hottest and driest place in the North American continent. But my wife will tell you it's a dry heat. This is an area called Artist Palette. The rocks are different colors from the different minerals in the rocks. 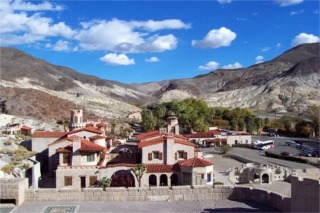 This is a picture of Scotty's Castle. The park service operates a wonderful tour of this facility. They do the tours in period costume and give you a lot of history and stories of the time. I can't recommend it enough. It was a wonderful day when we were here. About 75 degrees. We had a picnic under the palm trees. 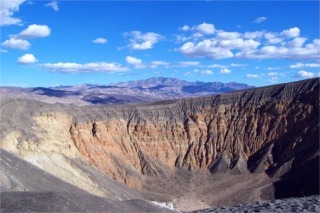 Ubehebe Crater. This was created more then 3,000 years ago by a volcanic explosion. It is 600 feet deep. The photo above is my first attempt at doing a panoramic show by putting together multiple pictures. It is actually 3 and was done without using a tripod. Ehhh not bad for a rookie. There are even more great photos we have of Death Valley but there isn't enough room for them all. I have some nice pictures from Badwater which is 285 feet below sea level. 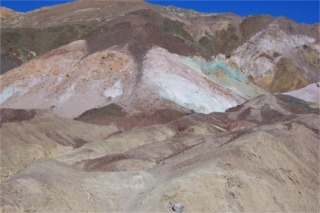 It is named bad water because all water flowing underground in Death Valley flows there because it is the lowest point. The water is very close to the surface and since it has no outlet it evaporates and leaves behind salts. So you have great salt beds.